Yemeni separatists have taken almost full control of the southern port city of Aden after days of fighting with government forces, residents say. It has already led to the deaths of 40 people since Sunday, the Red Cross says. 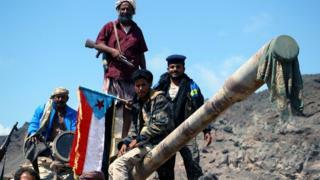 The separatists are also reported to have also seized Aden's military bases. Yemen's internationally-recognised government relocated to Aden in 2015, when President Abdrabbuh Mansour Hadi and his cabinet were forced to flee the capital, Sanaa, following an offensive by the Houthis. A assault on Sanaa prompted a Saudi-led multinational coalition to launch a military campaign to defeat the rebels. Since then, more than 9,245 people have been killed and 3 million displaced, according to the UN. Why are the separatists and government fighting? Supporters of two sides have fought alongside each other over the past three years but it has always seemed an uneasy alliance. Before the conflict, separatist sentiment had been running high in the south, which was an independent state before unification with the North in 1990. Although the separatists were suspicious of Mr Hadi - who is a southerner but supports continued unity with the north - they joined forces to prevent the Houthis capturing Aden and drive them out of most of the south. However, tensions between the two sides remained. The situation was made more complex by divisions within the Saudi-led coalition. Saudi Arabia backs Mr Hadi, who is based in Riyadh, while the United Arab Emirates - a key partner in the coalition - is closely aligned with the separatists. How did the clashes in Aden start? They erupted on Sunday after the expiry of a deadline set by the separatist Southern Transitional Council (STC) for a cabinet reshuffle, including the removal of Mr Bin Daghar. The council accused the government of "rampant corruption" resulting in a "deteriorating economic, security and social situation never before witnessed in the history of the south". The fighting, which has involved tanks and heavy artillery, began in the eastern Khor Maksar district, where the airport located. It quickly spread to the southern Crater district, near presidential palace, and the hills overlooking the sea port. As the separatists took control of official facilities and military bases, the prime minister denounced what he called a "coup". President Hadi, who is based in Riyadh, ordered his forces to secure Aden. By Tuesday morning, the separatists were said to have seized the last stronghold of the Presidential Guards force in the northern Dar Saad district and reached the presidential palace, where Mr bin Daghar is based. Sources close to the southern separatists told Reuters that negotiations were under way to allow Mr bin Daghar's government to leave the city safely, but a government source said the prime minister had no intention of leaving. Meanwhile, Save the Children has announced it is suspending all humanitarian work, citing security reasons. "Our staff are forced to shelter at home and in bunkers while gun battles rage outside," the charity's director in Yemen Temer Kirolos said. What's being done to end the fighting? The Saudi-led coalition urged both sides to cease hostilities on Tuesday. "The coalition will take all the measures it deems necessary to restore stability and security in Aden," a statement said. The US, which is supporting the coalition's campaign against the Houthis, expressed concern and called "for dialogue among all parties in Aden to reach a political solution". "The Yemeni people are already facing a dire humanitarian crisis. Additional divisions and violence within Yemen will only increase their suffering," it added. The UN's interim humanitarian co-ordinator in Yemen, Stephen Anderson, said the violence was having a negative impact on its operations across the south of the country. "Humanitarian movements within the city have been suspended and aid workers remain in lockdown in their residences, unable to continue critical life-saving activities," he warned.